Join us while we visit and review some of the most popular games trending the charts. Azul is a fascinating tile drafting game. Not only is it quite beautiful and visually pleasing, the strategy of the game play matches and exceeds the appearance. 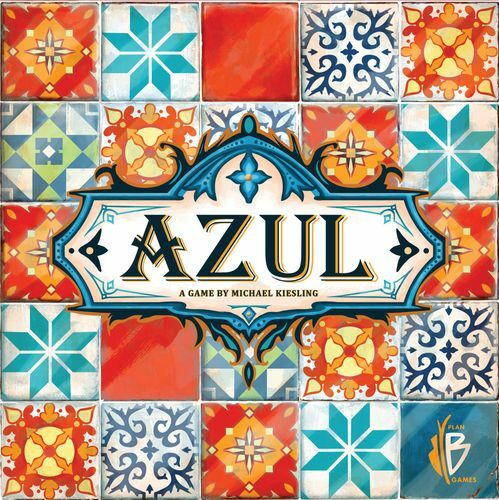 The basis of Azul is that you're an artist who specializes in tile laying and have been commissioned to display your artwork on the walls of the Royal Palace of Evora. Depending on how many are playing, there's a set number of factories available which each have a random assortment of four tiles laid upon them that can be used to create your art. When anyone wishes to take tiles from one of these factories, they must take all of that type available. If there are two red, one black, and one yellow tile and the player wishes to take only red, they must take both red tiles. The remaining tiles (the yellow and black) are moved to the street (in the centre). Instead of taking from a factory, a player could also take from the street using the same rules. The first player taking from the street becomes the first player rin the following round but also loses one point for the privelege. A penalty tile designates this. The tiles that have just been chosen are now added to your player board and placed in a row. Only one colour per row is allowed, so once you complete a row, that colour cannot be placed there again. There are five rows increasing from one to five tile slots. If a row is completely filled in at the end of the round, that colour tile is added to the player’s wall. If tiles are grabbed that don't fit, they're placed in a penalty row at the bottom of the player board which designates "broken" tiles, reducing your point score. The game continues until any player has completed one horizontal row on their board. Once completed, the game ends and the players total their scores. Horizontal and vertical rows are worth an additional points, and placing all of a single colour earns even more bonus points. The highest score wins. 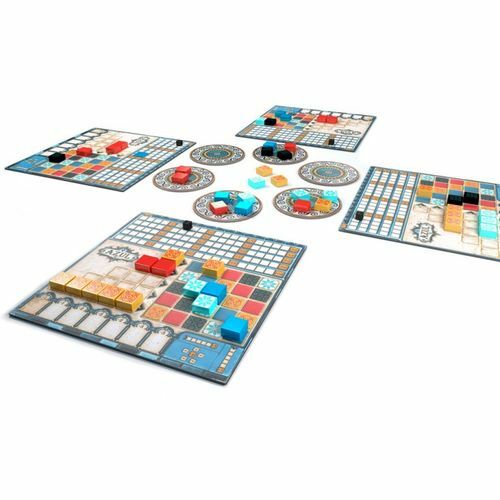 A game with simple mechanics, simple components, set-up and simple strategy, Azul is not one to be looked over. The game plays very quickly and has a small learning curve, making each play even more rewarding than the one before. This is a game that will appeal to a very broad audience of players, including non-gamers and those who have not yet been exposed to modern board games. Perhaps even your parents! Do you enjoy cooperative games, where you can work together to beat the game itself rather than crushing the spirit of your fellow players? Do you fancy the idea of impending death by dehydration in an unrelentingly hostile, unforgiving desert? If you answered yes to any of these, or maybe even no, Forbidden Desert might be for you. In this desert which is inexplicably forbidden, a team of scientists (you and your comrades) have arrived to excavate an ancient city that’s been long lost to the desert dunes. After they arrive, their helicopter is destroyed by a harsh desert storm, rendering them stranded, helpless under the hot sun with dwindling water supplies. Their only hope is to unearth and reassemble the remains of an ancient flying machine, hop on it and fly away before anybody dies of dehydration, exposure or being buried in the desert sand storm. Forbidden Desert is not a terribly complicated game. It’s very accessible to casual or non-gamers, yet still provides a difficult enough challenge to satisfy the typical gamer. Teamwork is strongly fostered (if any player dies, the game is lost), as well as thorough strategizing, while maintaining a tense and desperate atmosphere that only strengthens as the game progresses. Each tile of landscape that makes up the Forbidden Desert board has under it either a clue to find a missing piece of the flying machine, a tunnel for refuge, a helpful item to assist your struggle or may be one of two oases in the desert. All of these naturally begin covered in sand and have to be excavated, however, and your band of scientists has no way of initially knowing where anything is. The board begins with a blank area in the very centre, but this isn’t just your friendly neighbourhood blank space, it’s a sand storm. And sand storms don’t like to stay still. After each player’s turn, a number of cards from the sandstorm deck are revealed, which indicate the direction that the storm now travels in. The land tiles are shifted in the opposite direction of the storm, which of course in the process covers each of them with an additional layer of sand that must now be dug out in order to excavate that tile. In addition to this, throughout the deck are a number of Sun Beats Down cards, which cause all exposed players to take a swig from their water supply (or die of thirst if there’s none left), and Storm Picks Up cards which gradually increase the number of storm cards drawn after each turn. The game is won when the players find all of the missing parts, and everyone has returned to the launch pad to reassemble the machine and flee the desert. The game is lost if any player dies, if the sand tiles run out (the players become covered by sand), or the storm indicator reaches the very end. 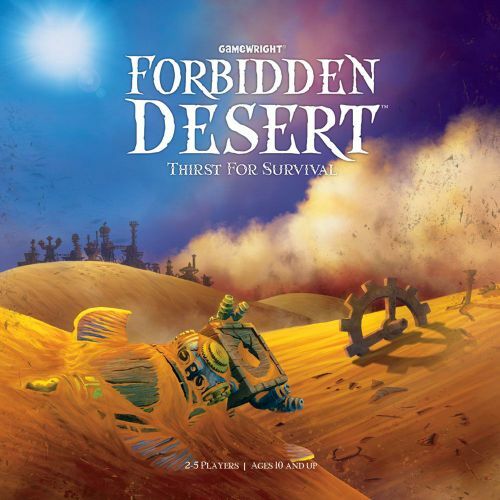 Such cooperative games must have a significant challenge in order to have the players work together on a solution, and Forbidden Desert does this well. There are often many different possible options each turn, and determining the right one is not exactly trivial. Combine this with a lower learning curve, a very well applied theme and a tense atmosphere, and the game really does serve as a shining beacon of accessible modern board games. 7 Wonders is a game that at its center focuses on drafting. It uses drafting order to build situations that score cumulative points, though the theme can seem to be somewhat tenuous or pasted on. A popular game among strategy game players due to its shorter length, 30-45 minutes, than most games of its type and because it plays best with 6-7 rather than 4. The game is, at its core, three decks of cards (labeled I, II and III) which are drafted in proceeding order with the goal of scoring the most points possible through drafting and combining them during play. All players select a card out of the initially dealt 7 simultaneously and pass the remainder on to the player next to them, and then the process is repeated until all cards but 1 have been selected. Cards typically cost resources to play, which can be drawn from either the player’s own tableau or purchased from a neighbour. Some cards may be free if certain prerequisites are already met. A player may elect to build part of their unique wonder instead of playing a card, which typically provides a benefit in the form of victory points or resources. When all three ages (I, II and III) have been played through, each player’s points are totalled and the player with the highest score wins the game. As for the gameplay, accumulating points in 7 Wonders is playing cards that complement each other. Choosing just a few types of cards to focus on is the main tactic. One of the clear strategies, for instance, is to repeatedly choose green (Science) cards, which work together to score an exponential number of points. Unlike Science cards, Military (red) cards accumulate points merely by winning battles - the margin of the win has no bearing on the points won. Resources act as another decision point as the player must decide how many resources to place without being able to predict exactly which resources will be required with the coming sets of cards. A major strategy is often counter drafting. Not only do you draft cards that are beneficial to your play, times it may be more worthwhile to decide to draft cards that prevent other players from furthering their own strategies. For instance, if a player is focussing on drafting green (Science) cards, they will have a heavy advantage if no other player is drafting the same type of card, perhaps leading to their victory if no counter-drafting is performed by other players. The game is notorious for being rather slow to teach, in part perhaps because of the various iconography and the general learning curve. It’s a popular game for a reason, though - the game works, and it works well even for larger player counts with very little downtime. Players who regard player interactivity may not appreciate 7 Wonders so much, as each player is mostly concerned with building their own point-generating economy without much engagement of others. Fans of strategy games will probably take a liking to this game, or even more casual players if the game is played with the right group and at the right pace, that is, quickly and without overly long deliberation that can easily bog down gameplay resulting in a significantly more boring experience. We're all tired of zombies, correct? That is to say, unless you're one of the hundred million individuals who continue purchasing each one of those zombie-themed amusements, the ones with the crazy amount of undead minis, and the shakers diversions, and each and every thing with a dismantled hand on the spread, the zombie thing lives on. I get it. Furthermore, I concur. Zombies have run their course. Down with the undead. Long experience the living. Yet, you're going to need to take my pledge on this one: Dead of Winter from Plaid Hat Games is another diversion with zombies in it, yet even along these lines, it's practically the best round of 2014. So lock in, keep that shotgun close within reach, don't believe anybody with a draining swathe on their arm — regardless of how often they demand they simply caught it on a broken window — and get prepared to perceive how great a zombie game can really be. Dead of Winter is really forthright with its setting: it's the center of winter and you're in control of a band of survivors, one of numerous gatherings that have met up to establish a state. In one game, you may begin with Buddy Davis, wellness mentor, and Carla Thompson, police dispatcher, who have obviously united in light of their implicit fascination for each other. In the following, you may have Loretta Clay, cook, and Forest Plum, an expert shopping center Santa, a lamentable matching if at any point there was one. They signed up in light of the fact that they were edgy, and it never improved. Particularly after Forest Plum purported his affection. Wow. As well as the freezing setting, there are zombies. Processing around, looking through the blockaded windows, biting on stuff — y'know, zombie stuff. On the off chance that it improves you feel, you can imagine they're wolves. Wolves that separate blockades and transform individuals into more wolves. In either case, between the undead (or wolves) and the climate, the state has developed short on sustenance, ammo, spirit, and rational soundness. This is one of those uncommon "great" zombie games. You know the ones I mean, where the undead are more situated dressing and less centerpiece. They're an illustration, one assumes, for death, or unavoidability, or ineptitude. You can outwalk any of those things, at any rate for some time. Be that as it may, then you begin considering, "Perhaps I don't need to outwalk this zombie on the off chance that I can trip my amigo." Or you begin quarreling over who gets the opportunity to wear the new match of shoes you searched in light of the fact that your feet are crude with rankles. On the other hand about who gets to chow down on the world's last nutri-grain bar. Before sufficiently long you're wrestling on the ground for control of a dropped gun and the zombies are getting closer by the second. The fact of the matter is, Dead of Winter speaks the truth about individuals, not the zombies, and nothing makes that clearer than the way you go about surviving life in the camp.